Gene expression profiling of pathological and physiological CFs. (A) PCA of log-transformed FPKM data from 19 individual CF samples from C57BL/6 animals of the indicated treatment group using the first and second principal components (PCs). There were 8500 of 23,359 genes included, where at least 5 of the 19 samples had a FPKM > 1. No other feature selection was performed. (B) Spearman correlation and average linkage of the same 19 samples in A indicates consistency between biological replicates, which cluster in a hierarchical manner. (C) Ingenuity Pathway Analysis (IPA) of CFs at 10-day TAC (disease) versus control (top) or 10-day swim (exercise) versus control (bottom). 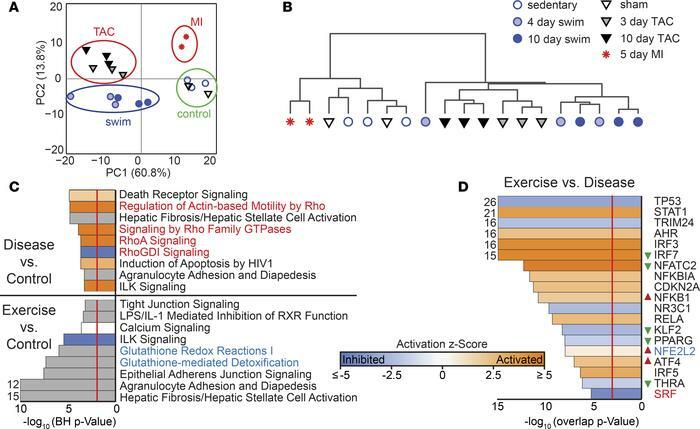 The gray bars indicate that there is no activity pattern available identified in IPA, despite highly significant association of the genes within the pathway. Orange, positive z-score; white, zero z-score; blue, negative z-score; gray, no pattern. Vertical red line indicates a Benjamini-Hochberg–corrected P = 0.01. (D) Predicted upstream regulators from 10-day swim versus 10-day TAC are shown that have overlap P < 0.001 (red line). Red and green triangles indicate direction of change in expression in exercise versus disease, if significant. Red and blue text in C and D indicate myofibroblast regulation and detoxification pathways, respectively, and indicate a mechanistic link between TF and IPA canonical pathway.